This entry was posted on Thursday, November 9th, 2006 at 10:46 am and is filed under Uncategorized. You can follow any responses to this entry through the RSS 2.0 feed. You can leave a response, or trackback from your own site. 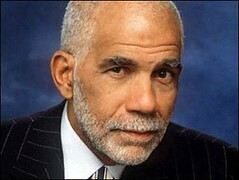 Sadness….I will miss Ed Bradley and his rebellious earring. This is not about my birthday tomorrow. It is something far more important. It started 3 years ago when a somewhat annoying kid moved into my neighborhood. He all too often ran passed by my house and asked if I wanted to play. Our arguments were legendary. His name is Chris, and he has two fathers. He is an adopted son to two gay fathers (or one rather, you will see why). I befriended both dads. One went by the name of Sonny; the other went by the name of Louis. Sonny often drank spring water and took many medications. Louis was a neat freak to the extreme. I just find it funny that a neat freak and slob were engaged to each other. Chris had a brother also by the name of Louis (I always thought Chris’s brother was cooler than he was; now I see they both have their ups and downs). I got along with Sonny the best though; it was easy for me to talk to him because of how much we liked history (I usually socialize better with people older than me). He was 55 I believe. Louis and I often joked with one another. Chris always wanted to play sports, and Louis just showed me respect (plain and simply, the way it should be). Over these past three summers the main thing that kept me to play with Chris is the fact he has a pool (though he can’t swim). That and it was worth sharpening my skills at basket ball with him. He is also the person that got truly into the whole Star Wars obsession. Chris and me are now nearly best friends (though the debate of weather or not I want to come over remains). I also all too often had a great many mature and intelligent conversations with Sonny. He is the reason why I support gay marriage (damn the hegemonists that would stop it!!!). Sonny was on a respirator, and sometimes he went to the hospital. Over the summer he was in there for six weeks. A bad time indeed. The last time I saw him was on his 56th birthday. As a gift against my normal sense of masculine insecurity, I let him hug me. He was thankful towards me, as I was to him. Now, on the eve of my birthday (two weeks after his) he passed away in the hospital. I was told this afternoon when I came home from a missed after school Voice appointment. Chris alerted me, I still don’t know about his funeral 9he likely died to heart failure). If any of you say he died because he was gay, and he offended god. When I find you, you’ll find Jesus pretty fast!! I write this in his memory, so I ask you to repost this in his memory (but nothing else tonight). Or you could take a vow of bulletin silence until tomorrow (you can message me on what you think).